Carrying the gardening metaphor forward, there’s not a lot you can do to control the weather. As a whole that’s true in economic gardening as well, but how about encouraging your own microclimate in order to foster a healthy local economy in the middle of a national downturn? It turns out that’s just what many communities are doing through their “buy local” efforts. A recent Business Week article tracks the relative success of independent retailers in communities with active campaigns. Author John Tozzi points to the insulating effect of keeping more dollars circulating locally. 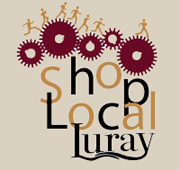 While the article includes a slideshow of campaign images from around the country, Luray’s “Shop Local Luray” campaign holds its own against them with a fun approach to the concept clearly identified in the logo: we can all play a part in keeping our local economies moving. That’s the message that Michael Shuman, author of Going Local: Creating Self-Reliant Communities in a Global Age and The Small-Mart Revolution, has been delivering for the last few years. He was featured in a recent Christian Science Monitor article, and with layoffs hitting many larger employers across the country, more communities are tuning into his message. For more resources, check out his blog, or visit: livingeconomies.org, the Web site of the Business Alliance of Local Living Economies.